Minted has opened it's first pop-up shop in San Francisco! The grand opening was last Friday so I thought I'd share a few photos of the store itself. I can honestly say that I am SO proud to be part of this community. They really believe in independent artists and value their talent which is kind of hard to find nowadays with so many online print-on-demand shops. I have some products for sale in the shop and my bio and photo is up on the wall, too, which is SO cool! I wish I lived closer to see it in person! They have also teamed up with Christy Turlington Burns to donate a portion of the proceeds to her charity, Every Mother Counts, which helps mothers across the world. In Style magazine wrote an article on it, you can read more about the partnership and details here. Another reason why I love Minted! Here are a few pics, you can also read Minted's article and see more photos. And if you're in the San Fran area, go check it out, the store is located at 222 Grant Avenue, San Francisco, CA 94108; they’re open Monday through Saturday from 10 a.m. to 7 p.m. and Sunday from 11 a.m. to 5 p.m. I'm completely in denial that school is starting in a few weeks, you? I don't even want to think about it. Summer is my absolute favorite time of the year. I'm definitely a summer, sun, beach kind of gal so the thought of that going away makes me cringe every year. BUT I do love fall, too, so there's that! And if I have to label every little thing in my kids' backpacks, here's an easy way to do it! These new personalized label stickers will save your hand from cramping up trying to squeeze your 9 letter last name on the side of a tiny glue stick. And the best part is that they're waterproof and dishwasher safe so you can throw those reusable water bottles in the dishwasher with no worries! Gadgets is geared towards boys with the headphones and iPhone icons but also comes in yellow and orange for girls, too. And the second, Scripted Love, is a photo sticker and would look great on top of a gift for those endless birthday parties you're running the kids to! Especially for the little ones that can't read yet, all they need to do is look at the picture to see who the gift is from. Genius! 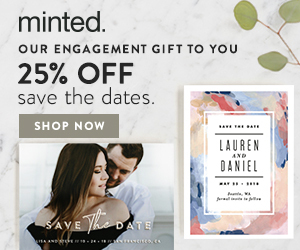 Click through the links or photos to purchase directly from Minted. And enjoy the rest of your summer!